Gülten Akın has long been honored as one of Turkey’s leading poets, but English translations of her work are scarce. All the more reason then to welcome What Have You Carried Over?, which offers translations of work selected from twelve of her books published between 1956 and 2007—a sixty-year stretch that witnessed some of the most serious traumas of modern Turkish history, including three military coups. Akın and her family were not spared. sought relief in petitions, in more petitions. . . .
A variety of personae make their appearance—a husband, a son, a grandparent, a soldier eavesdropping on a suppliant mother: “My sons . . . It’s been a week since they took them from home. At five in the afternoon. I haven’t heard from them. It’s been a week. I’ve looked everywhere, knocked on all the doors” (#37, “Juan and Pedro Almonte’s Mother”). Tension rises as the strike wears on. Mothers grow desperate, children turn inward. “How will the mother—who may only see him for five minutes once a week to say nothing more than ‘How are you?’—reach out to him, get him to abandon his path of no return?” (#8, “Laughing”). She does not, of course; she cannot. And so the strike continues. Petitions are got up. Mothers from the poverty-stricken east, some barefoot, travel to the capital to join the others, but to no avail: their children in the notorious prison back home succumb, thus necessitating another journey, this one to collect the bodies of their sons and daughters and take them home. Is it any wonder that they lay a curse—a blight—upon the land as they travel across it? 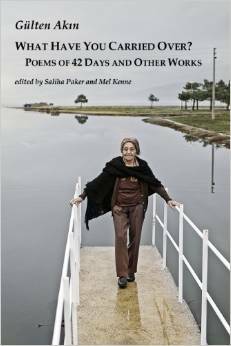 (#20, “Blight”) Published six years after the 1980 coup, itself the climax of a decade’s worth of troubles, Poems of 42 Days is a powerful testament highly regarded in Turkey for its unflinching dissection of prison psychology and soul-shriveled authority. It is about time that it appeared in English, for it applies not merely to the Turkish experience but unfortunately to all too many political situations of our era. aaaaaa . . . . . . . . . . . . . . . . . . . . . . . . . . . . . . . . Widely popular in Turkey, Hıdır (who seems incidentally to be the original of the legendary Green Man, a.k.a. Saint George, of British folklore) is particularly revered in the Alevi-Bektashi strain of Sufism to which Akın belongs. It is the same tradition that produced Yunus Emre, Pir Sultan Abdal and other medieval poets of divine love and political resistance, and is central to her inspiration. I can’t write a word, my son. Dickinson and Akın together might seem a stretch, but in truth they share a “haunted house” of poetry that is marked by candor and pain, a place where the transcendental jostles the mundane, and to enter which may raise the hair at the back of your neck. “Poetry is nuclear energy squeezed into lines,“ Akın once said, and it’s hard to imagine Dickinson disagreeing. The English reader is fortunate finally to have a garland of Akın’s work gathered in a single volume. The selection accurately epitomizes her poetic achievement; the poems moreover take on fresh energy from their new context. Translations are by several hands, including such well-known names as Nermin Menemencioğlu, Ruth Christie, and Talat Sait Halman, as well as by participants in the Cunda Workshop, where the idea for this project first arose. The majority, however, are collaborations by the editors, Saliha Paker and American poet Mel Kenne. They are nearly all a model of the art, transmitting the sense of the original with subtlety and fidelity while resisting the temptation to fill in or gloss over syntactical lacunae and semantic ellipses characteristic of Turkish poetry—what poet and translator Murat Nemet-Nejat has called its indispensable eda. What Have You Carried Over? effectively and elegantly delivers the poetic news from Turkey, for which poet and translators alike deserve our thanks. Akın, Gülten. What Have You Carried Over? : Poems of 42 Days and Other Works. Eds. Saliha Paker and Mel Kenne, with an Introduction by Saliha Paker. Talisman House, 2014. Mel Kenne, Saliha Paker, Amy Spangler, eds. Aeolian Visions / Versions: Modern Classics and New Writing from Turkey, from the Cunda International Workshop for Translators of Turkish Literature, 2006-2012. London: Milet, 2013. Murat Nemet-Nejat. Eda: An Anthology of Contemporary Turkish Poetry. Jersey City, N.J.: Talisman House, 2004. Clifford Endres lives in Istanbul, where he teaches at Kadir Has University and Boğaziçi University. He has translated (with Selhan Savcigil-Endres) the Turkish poets Bedri Rahmi Eyüboğlu, Enis Batur, Güven Turan, and novelist Selçuk Altun among others. These have appeared in Agenda, Chicago Review, Edinburgh Review, Massachusetts Review, Near East Review, Quarterly West, and Seneca Review among others.